A season of five famous ballets from the Royal Ballet is being screened at Cinema Nouveau theatres over the next few months. The season launched with Alice’s Adventures in Wonderland in March. The next production to be shown on the big screen is the iconic ballet set to Tchaikovsky’s beautiful music, Swan Lake (from Saturday, 02 May). 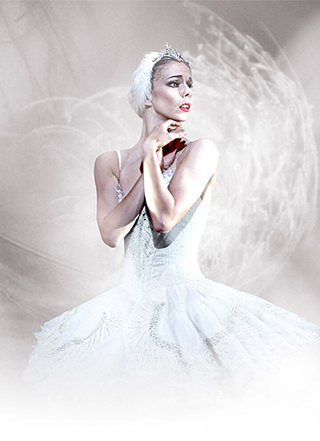 Swan Lake, surely the greatest of all Romantic ballets, is the captivating story of a beautiful woman transformed into a swan, and a heart-rending tribute to the power of love. The ballet is a perfect synthesis of choreography and music and, though Tchaikovsky did not live to see it become a success, his first ballet score is now synonymous with ballet itself, inspiring generations of dancers and crossing over into popular culture. Anthony Dowell’s Royal Ballet production stars Principal dancers Natalia Osipova and Matthew Golding in the lead roles of Odette/Odile and Prince Siegfried, in a formidable partnership. Tchaikovsky’s iconic score and Yolanda Sonnabend’s set designs inspired by The House of Fabergé recreate the glamorous opulence and drama of the Russian court, while the famous lakeside ‘white’ acts are rich with mist, shadow and haunting moonlight. Introducing the cinema screening, presenter Darcey Bussell, who danced as a Principal with The Royal Ballet for nearly 20 years, first danced Swan Lake in 1990. The lead role of Odette/Odile, which was initially created for two ballerinas, demands first-class technique as well as dramatic interpretation. 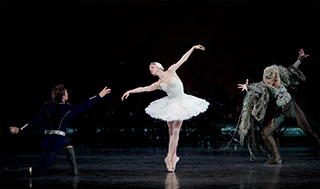 In the ballet, Prince Siegfried chances upon a flock of swans while out hunting. When one of the swans turns into a beautiful woman, Odette, he is instantly captivated and determined to break the spell that holds her captive. The evil spirit Von Rothbart, arbiter of the curse, has other plans however, and disguises his daughter, Odile, as Odette. Fooled, Siegfried declares his love for her, and so dooms Odette to suffer under the curse forever. Swan Lake is perhaps the most iconic of all ballets. A romantic fairytale set to Tchaikovsky’s masterful score, it features some of ballet’s most famous set pieces, and is demanding for the corps de ballet and Principal dancers alike. Dancing in perfect synchronisation in the lakeside scenes, the corps de ballet, an array of swans in spectacular white tutus, give the production a lyrical beauty. The dual role of Odette (the white swan) and Odile (the black swan), is one of the most challenging in the ballet repertory and requires the portrayal of both the gentle and vulnerable swan princess Odette and her predatory alter ego Odile. It’s the role every ballerina dreams of dancing. The live performance on 17 March was captured for release on cinema screens worldwide. Ross McGibbon, a former member of The Royal Ballet, directs the live cinema production, which also includes exclusive backstage footage and interviews with the cast and crew. Swan Lake releases on South African screens on Saturday, 02 May for four screenings only – on 02, 06 and 07 May at 19:30 and on 03 May at 14:30 – only at Cinema Nouveau theatres in Johannesburg, Pretoria, Durban and Cape Town. Bookings are now open. The running time of this ballet production is 2hrs, 10mins plus two intervals of 25mins (after Act II) and 20mins (after Act III).